How to start this? I’m sitting in a hotel room in Des Moines, Iowa. I just had an awful competition in front of a spectacular crowd on a perfectly gloomy, albeit dry, day. It’s April in Iowa. Might as well start with my blog talking about my approach to training. Don’t worry! There’s only so much I can write about training before I get bored too, so I’ll focus on the big picture stuff and add some color every now and then. There are four key attributes of a world-class athlete. Really three, but they are all about developing the fourth. The first attribute is “Desire”. You see a lot of athletes that have all the desire in the world, but they lack something else. The second attribute is “Physical Ability.” “Physical Ability” is something we all strive to develop. In fact, that’s what most our active training (lifting, running, jumping, etc) is designed to influence. It’s annoying when you see someone with all the desire, but they simply don’t have the physical abilities to move on to the next level. Perhaps even more annoying are those wonderful physical specimens who have no desire at all and can still compete at a high level. The third attribute is often overlooked “Psychological Orientation.” It’s your psychological orientation that determines how you will perform under pressure. Coaches hate seeing an athlete put in all the work, possess all the physical abilities to perform, demonstrate their abilities time and time again in practice, only to wilt under the pressure of a high caliber competition. The final attribute is “technical execution.” Maybe you could call the mastering your sport. You have to achieve a certain level of technical proficiency and CONSISTENCY to improve. If you execute a technique differently every attempt, you will never develop the consistency to perform well or develop training programs that can lead to improved performance. 1) We all tend to focus too much on strength development. There are certain minimum thresholds of strength necessary to be a world-class athlete. Instead of focusing on maximum efforts, focus on training the appropriate energy systems relevant to your sport. Don’t know what I’m talking about? You should look it up. 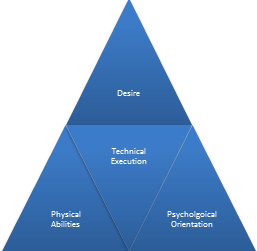 2) It’s just as important to plan a training program for your psychological orientation. Plot out your mental training program with the same attention to detail as you do your other training programs. In time, the mental training will become second nature and you will do it automatically. And guess what? Most of the guys beating you aren’t that much better physically; they are usually better technically and, more importantly, mentally. Be a mental giant no matter what level you compete at! 3) There is not a magical program. A successful training program will make you stronger physically, mentally, and technically. The 10,000-hour rule applies to sports mastery as well. That rule states that after 10,000 hours of training you should be a master of your event. If you train 40 hours a week, it would take you 5 years to become a master. That’s not practical for most of us, so it might take 10 or 15 years. Pace yourself! Thanks for reading and supporting the TFAA.